With a design show as fantastic as this one, it’s hard to capture it all. Soaking it in is yet another story! In fact, I’m still soaking in the whole weekend of the Interior Design Show West held at the Vancouver Convention Centre. There were so many amazing displays of quality, craftsmanship, and pure creative genius, I don’t even know where to begin. 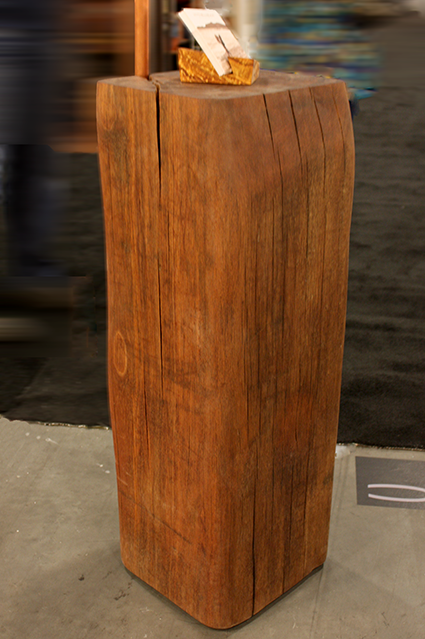 But, since Matthieu LeBlanc’s reclaimed wood creations was definitely one of my favorites, why not start here? 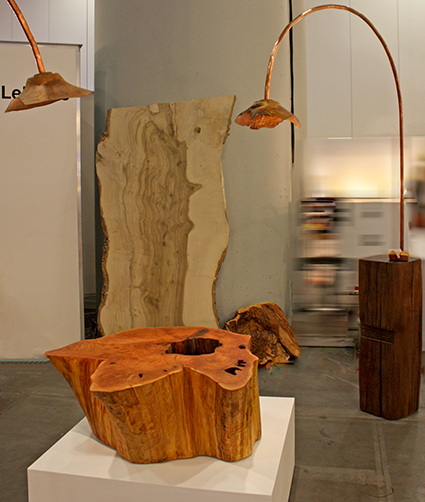 These sculptural arc lamps are made of apple wood. And their base from a piece of beach combed mahogany washed up on shore! And how about this gorgeous table? Matthieu calls this the ‘Footprint’ table. Can you see it? And what’s a design show without amazing seating? 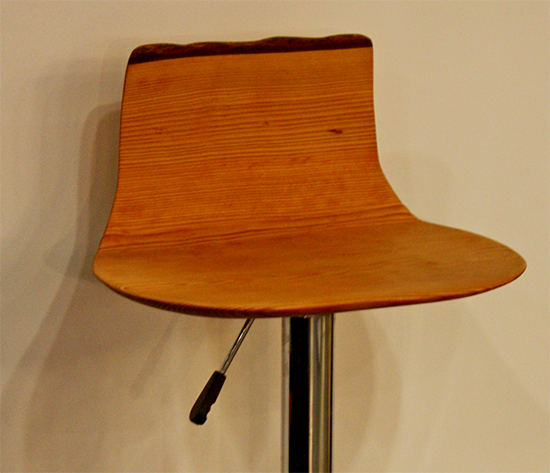 This signature bar stool is made from Douglas fir. Here’s another look, you know, a little more up close and personal! Love the grain in it! Yes, these pieces are all made from reclaimed wood. Either donated, salvaged, or beach combed. Beautiful wood with its own history, a fresh start and the beginning of a new story… and the storyteller, the master behind the artistry, Matthieu LeBlanc. Just a little taste of so much more! What do you think? Can you see one of these pieces in your home? Which one would you choose? I adore his work and will dream about getting one of those lamps!! You should send him a link to your post. I’m sure he’d be absolutely thrilled with such a nice review. I took your suggestion and ran with it! And a good thing, because I got the wood wrong on the lamp bases, so have since corrected it (eeek!). Matthieu has also offered to send more details behind each piece, so when I receive it, will add a little more to the post! I’ve been waiting for your IDS West posts and look forward to more! LOVE the footprint table and would happily find a home for it in my house. I liked the bar stool, that’s gorgeous! Love them all. 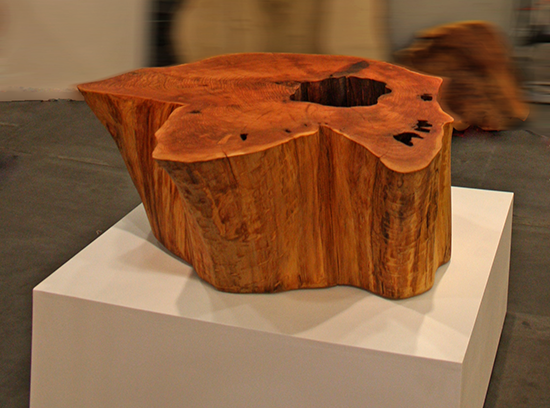 These pieces speak to my soul…don’t know if it is wood itself or the previous life it once had but I love it. Thanks for sharing! Another booth I sadly missed! I would have loved to see these gorgeous pieces in person. A fantastic post Sheila! What beautiful work. I love anything that brings the outdoors inside. It makes the home so warm and inviting. Thanks for sharing. Very talented artisan! Good combination of form and function. 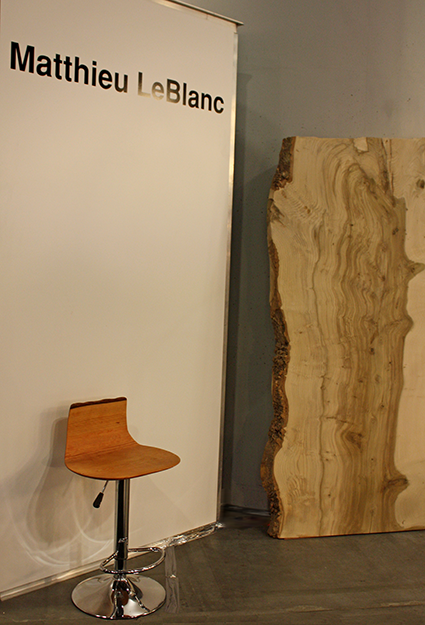 My favourite piece is actually the live edge slab leaning up against the wall – do you know what it’s destined to be? I don’t know what the plan is for that slab, but isn’t it amazing? Artists that ooze talent such as Mathieu continue to amaze and impress me. I can’t imagine having that much talent to create something so awesome. I would definitely go for one of the lamps – how neat, original, and unique. 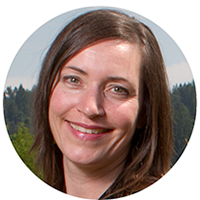 Will you be posting more about IDS West? I saw a few tweets here and there but love to read about it some more. I looove Matthieu’s work! The lamps were definitely my favorite, and oh, how I would so love to have one, too… When your comment came in I was in the middle of putting my next post together about IDSwest! I’m so glad you want to see more. I didn’t cover anything close to what there was to see, but I tried to cover the exhibits that align with my style. I hope you enjoy the next recap! I didn’t know you were there! Richard and I went on the Friday. So awesome. My fave was the guy who made the white resin tables with trunks of old trees as the base. Just beautiful. Best of all, I didn’t see one stone sink there, which is great news for Richard’s business! How cool that you and Richard were there! It would’ve been awesome to connect, even if just for a quick hello, or drink at the Bocci bar 😉 I am so with you on the white resin tables – those just blew me away. I’ve never seen anything like them before! Thank you so much for your comment. It was so great to see your name pop up – would love to keep in touch! Beautiful Pieces – I love the footprint table! The wood has such a West Coast feel – thanks for the glimpse Sheila. Such gorgeous pieces Sheila! What a very talented artist! Thanks for sharing.